The Right Rev. John (Jack) Reginald Sperry, former bishop of the Arctic, will be remembered as a spiritual mentor, linguist, and a lover of Inuit culture. He died Feb. 11 in Hay River, N.W.T., at the age of 87. Born 1924 in Leicester, England, Bishop Sperry served with the Royal Navy from 1943 to 1946 before emigrating to Canada. He often said that living in close quarters with sailors taught him more about ministry than formal education. In 1950 he moved to Kugluktuk (then Coppermine), Nunavut, where he served as missionary for 19 years with his wife Betty, a nurse. Bishop Sperry also ministered in Fort Smith, N.W.T., before being elected diocesan bishop in 1973, a position he held until he retired in 1990. When the young Mr. Sperry first arrived in Kugluktuk, the Inuit lived a traditional life on the land and primarily spoke Inuinnaqtun, known to few non-Inuit. Mr. Sperry knew he would only learn the language by being with the people. For several years he followed them out on their trails, travelling by dog team and sometimes covering more than 3,000 kilometres in a winter. Remote locations demanded extreme skills. Bishop Sperry was sometimes called on to be dentist and extract rotten teeth. Sometimes he acted as midwife when Betty delivered babies. 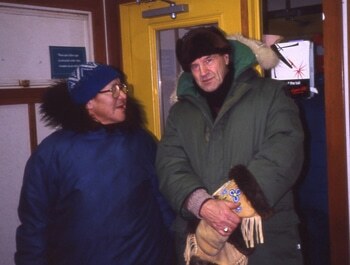 He also led the community in building Kugluktuk’s first church and managed later expansions. Through persistent conversation with local speakers, Bishop Sperry mastered Inuinnaqtun. He translated the Bible, prayers, and hymns and taught locals to read and write, sometimes in syllabics. His short language guides and one-on-one lessons equipped many clergy from the south. Bishop Andrew Atagotaaluk, current diocesan bishop of the Arctic, credits Bishop Sperry for preserving local language and championing Inuit culture during a time of great change after the 1950s. “Technology came very quickly to some of the remote areas and I think he had much influence on making us sensitive to who we were as Inuit people,” said Bishop Atagotaaluk. Nurturing local leadership was also a priority for Bishop Sperry and the young Andrew Atagotaaluk was one of the many Inuit he mentored. Bishop Atagotaaluk, who called Bishop Sperry a “spiritual father,” was educated at the Arthur Turner Training School in Pangnirtung and became the Anglican Communion’s first Inuk diocesan bishop. “Bishop Sperry understood that clergy could be raised locally to minister to their own people,” he said. Bishop Sperry’s love for the Arctic land and people ran deep. Snowmobiles were often his preferred mode of transport between communities, even if it took a whole day. He would savour mid-way breaks of bannock and tea. Wherever the Sperrys served, their home became a community hub. A former parishioner remembered that the Sperrys taught local children to knit, sew, and cook. They also started Guide and Scout programs and organized all-night soccer games. In Kugluktuk the Sperrys set up Christmas feasts at the church, where each family would receive a quilt full of gifts. A highlight for many was the Christmas pudding made with hard-to-get ingredients: rice and raisins. After retirement Bishop Sperry served as chaplain for the Canadian Forces Northern Region and visited elders who only spoke Inuinnaqtun. He also wrote a memoir, Igloo Dwellers Were My Church. In 2002 Bishop Sperry was named to the Order of Canada. This year he was scheduled to receive one of 60,000 Queen’s Diamond Jubilee medals. Bishop Sperry is survived by daughter Angela, son John, and their families. On Feb. 18 he will be buried in Yellowknife beside his wife, who died in 2001.